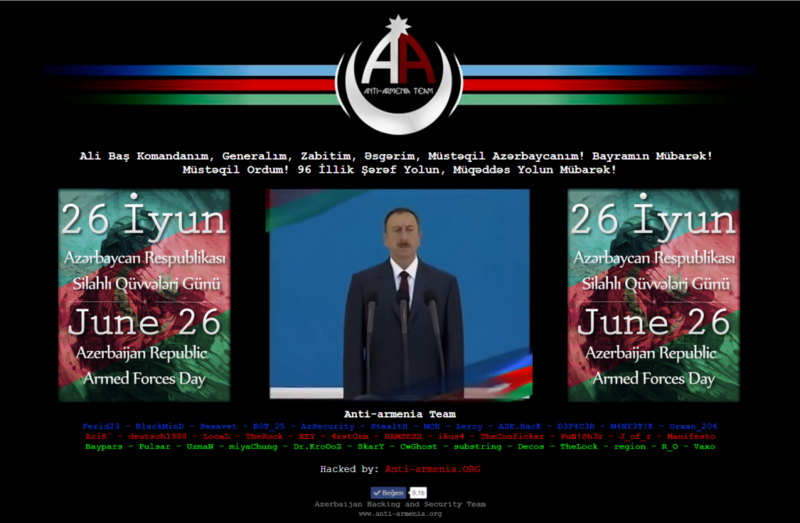 On 26 June, the day of Armed Forces of Azerbaijan -, Azerbaijani hackers from Anti-Armenian Team hacked and defaced the official website of Armenian President and other government Ministries. Hackers left a deface page along with a video message which includes a speech from the Commander in chief of Armed Forces of Azerbaijan Mr. Ilham Aliyev. My Commander in Chief of Armed forces, my general, my officer, my soldier, My independent Azerbaijan! Happy Holiday! My independent Army! Happy Holy way that you made in these 96 years period! Karabakh belongs to Azerbaijan! We would like to notify that Armenian armed forces occupied 20 percent of independent Azerbaijan and still keep this territory under occupation, despite the four resolution of UN, which indicates that Azerbaijani territories! occupied by Armenian armed forces have to be returned back! This is not the first time when Azerbaijani hackers from Anti-Armenian Team have target Armenian government. In past the same hackers hacked into the Armenian national security service and leaked classified documents. Click here to read previous hacks. At the time of publishing this article, all websites were restored. However, the Google cache of Armenian Presidential site is still displaying the deface page left by the hackers.